scientificresearch.ca is the only SR & ED directory in Canada. We have hundreds of Canadian companies visiting our site every month looking for firms to help them prepare their Scientific Research and Experimental Development claims. If you are looking to grow your SRED consulting business, start by advertising in this important SRED directory. Our Scientific Research directory is well-positioned in all major search engines. 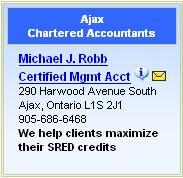 For most common searches, like Toronto SRED Consultant, our SRED directory is generally in first place. Here are just a few of the benefits your firm will receive by being featured in this SR & ED Consultants Directory. Very high search engine placement for Google, Yahoo, MSN, etc. Our featured SRED consultants listings are shown in blue at the top of the home page as well as at the top of the region-specific pages. Enhanced SRED Listings are shown in yellow on the home page as well as on the region-specific pages. Enhanced listings are just $299/Year. The "information" icon near the top of your Enhanced Listing indicates that the user can obtain further information about your firm by hovering over the icon and displaying the InfoBox Advertisement. Add an image to your Information Box Advertisement: the Standard Pricing is doubled. Firms wishing to be listed in the Other SRED Consultants tab on the home page, can request to be added to our white page listings. These listings are free for the first listing. If you wish to include more than one address for your firm, there is a one-time fee of $99 for each additional address.